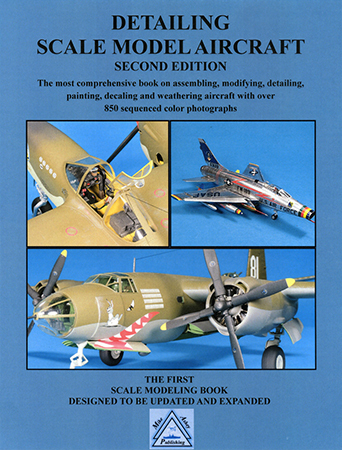 Mike Ashey bills it as "The first scale modeling book that is designed to be updated and expanded". Also included is a set of quick reference workbench tips across four separate pages. And the whole thing comes in either privately printed or PDF forms. Both novice and experienced enthusiasts can learn much from this handy handbook. From parts removal and clean-up through assembly and detailing to painting and finishing, Ashey's lavishly illustrated effort guides your every step. And he helpfully notes all tools, supplies, paints, replacement parts, and accessories used in each section. I've modeled for decades. And I never considered using automotive gasket material to replace damaged paint cap seals! Note, however, that Ashey largely employs conventional hobby products. So in "filling seams, voids and gaps", you won't find reference to, say, 5-minute epoxy and denatured alcohol. And when handling "dimples and injection marks", you won't see mention of "white-out" typewriter correction fluids. Nor will you spot use of stretched plastic shafts from cotton swabs to replicate hollow tubing. You will, however, find practical, picture-packed, step-by-step descriptions of, for instance, instrument panel detailing, biplane rigging, and paint masking – and dozens more assembly and finishing activities. And best of all, Ashey's techniques are applicable across a range aircraft modeling projects. But I really think setting up a "simple paint booth on the top of your stove" remains a decidedly questionable idea – at best! Ashey's printed manual comes printed on heavy stock paper – pre-punched for storage in a customer-supplied 3-ring binder. Open it – and lay it flat – on your workbench. The password-protected PDF version requires e-mail service that accepts up to 20mb attachments. I found it less bulky than its printed counterpart. But you should probably load it onto, say, an old iPad – as I have – to use it during model assembly and painting. For less than the price of a couple after-market 1:32-scale decal sheets, Mike Ashey says, you enjoy a systematic guide to assembly and painting your next aircraft kit. I agree. My sincere thanks to Mike Ashey Publishing for this review copy!